With a population of under half a million occupying a land mass the size of the U.S. State of West Virginia or the Japan’s Hokkaido, there’s plenty of “elbow room” in Tasmania, but enough modern infrastructure to make a vacation in Tasmania comfortable and enjoyable for anyone. Most travelers arrive in Hobart, the State’s capital. Hobart has come a long way since its establishment as a penal colony in the early 19th century. A vibrant, cosmopolitan city, Hobart still has an old world charm, making a Hobart Tasmania accommodation an ideal base from which to begin your exploration of Tasmania. Bruney Island is just an easy hour and a half away from Hobart, but once you’re there, you get a taste of the real spirit of Tasmania. Take an ecotour of the island’s perimeter by boat or explore South Bruny Island National Park on foot. Nature walks and hiking trails have been provided for all levels of fitness, from short, easy strolls to serious treks. Tasmania’s commitment to its environment is evident in the fact that over 40% of its land mass is set aside as National Parks and Nature Reserves. Those areas that are not are largely composed of small rural communities individually committed to environmental responsibility. The community of Devonport, “Australia’s Garden Market” is renowned for its fresh produce. Getting to Devonport is easy via air or sea. For a real adventure, take the Spirit of Tasmania I or II passenger and vehicle ferry from Melbourne to Devonport. 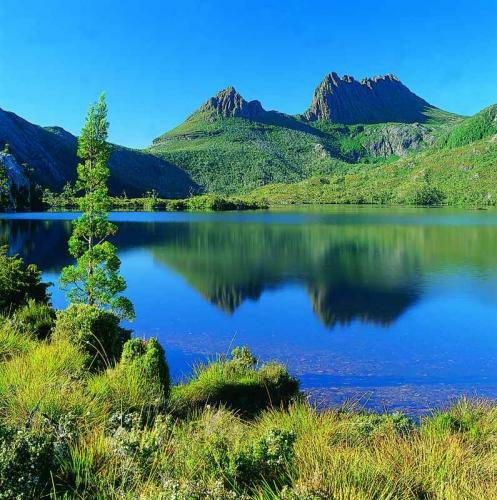 Once there, you will love the laid back, healthy lifestyle of the community and be within easy reach of one of Tasmania’s great National Parks, Cradle Mountain National Park. It has been scientifically established that Tasmania’s air and water quality is among the highest in the world. Those few areas that have equally pure water and air are largely remote and inaccessible. For example, Stanley, on the northwest coast, boasts the purest rainwater in the world and is at the doorstep of the magnificent Tarkine Wilderness, yet is easily accessible to visitors. Stanley Tasmania accommodations are available that allow visitors to relax in comfort without leaving a negative environmental footprint behind. Launceston is the second largest city in Tasmania, yet has a population of under 70,000. First settled in 1806, Launceston is peppered with wonderfully preserved historical sights. A marvelously laid out town, it lacks for nothing in the way of creature comforts, yet still retains an unhurriedly atmosphere. Cataract Gorge, one of Tasmania’s most breathtaking natural attractions is within walking distance of the center of town or you can use your Launceston Tasmania accommodation as your starting point for exploring the vineyards of the Tamar Valley and other attractions Launceston has to offer. These are just 5 reasons why you want to visit Tasmania. It wasn’t an easy list to compile, because it was so hard to narrow it down to just 5. Discover Tasmania, the world’s most accessible natural wonderland yourself and make a list of your own. Sidney writes for ‘Book it Now’ about Interesting Australian destinations like Tasmania. Find a great range of accommodation in Tasmania, along with information about tours, attractions and Hobart accommodation to help plan the perfect vacation to Tasmania.